Kuwait’s Prime Minister His Highness Sheikh Jaber Al-Mubarak Al-Hamad Al-Sabah inaugurates his country’s new embassy building in Jordan. AMMAN: His Highness the Prime Minister of Kuwait Sheikh Jaber Al-Mubarak Al-Hamad Al-Sabah said yesterday that his visit to Jordan aims to propel the Gulf state’s ‘historic’ ties with the Hashemite Kingdom to new levels. The Kuwait prime minister handed Jordan’s King Abdullah II a letter from His Highness the Amir Sheikh Sabah Al-Ahmad Al-Jaber Al-Sabah. He also held talks with the Jordanian King and other senior officials on matters of mutual concern. Furthermore, the Kuwaiti premier pointed out that bilateral ties have seen ‘tangible progress’ in recent years. He went on to commend the Jordanian government for its efforts to achieve the country’s development goals, saying cooperation with Kuwait has been very satisfactory. His Highness the Prime Minister’s visit saw the holding of the fourth joint higher committee session, as well as the signing of some 14 agreements, in addition to inaugurating Kuwait’s new embassy building in Amman. Jordanian Premier Omar Razzaz described his country’s relations with Kuwait as ‘exemplary’ of pan-Arab ties, as such ‘pinnacle’ of a bond should be followed on all levels. 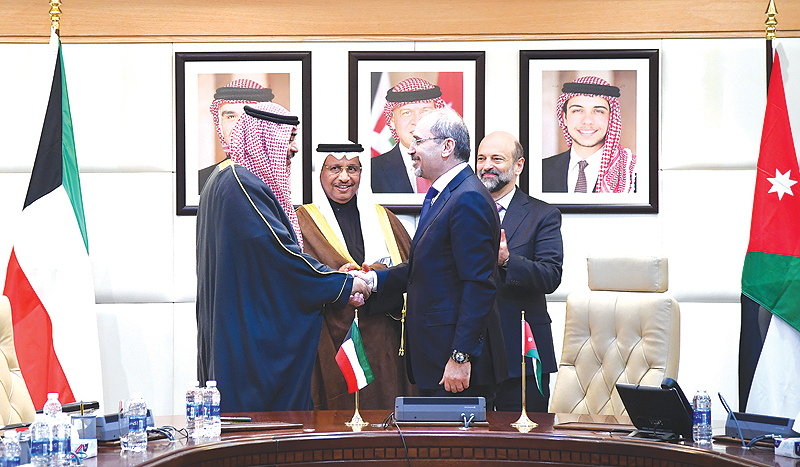 “Relations with Kuwait are solid and deep-rooted, which enabled both countries to achieve mutual interest and benefit for both peoples,” Razzaz said. The visit would buttress the ‘fraternal’ relations, especially that it coincides with holding the committee meeting; after six years of holding the last one, Razzaz pointed out. The delegation accompanying His Highness Sheikh Jaber Al-Mubarak comprises Ministers of Foreign Affairs, Finance, Commerce, Education and Justice and other senior officials. The delegation also includes several Kuwaiti businesspersons and representatives of the private sector, which confirms the interest in developing economic ties and opening up wider horizons for trade and investment cooperation between the two countries. By 2017, trade volume between the two countries amounted to $400 million, while Kuwaiti investments in Jordan reached $18 billion; of the highest among foreign investments in the Arab country. Relations between Kuwait and Jordan, established in 1961, have progressed in many domains and the two countries are committed to 57 cooperation agreements covering many areas. In the meantime, Speaker of Jordan’s House of Representatives Atef Tarawneh affirmed the importance of partnership with Kuwait as it could result in more cooperation and integration. “Kuwait and Jordan’s relations are deep-rooted and this visit is considered an additional step towards buttressing those relations, under the patronage of His Highness the Amir Sheikh Sabah Al-Ahmad Al-Jaber Al-Sabah and King Abdullah II,” Tarawneh noted.